BARNES&NOBLE.COM HE WAS RIGHT about the influence of Black Jacques, or of some strain that began before Black Jacques and reached its full flowering in him, but I wasn’t sure then just what it meant to be like Black Jacques or like Fat Hank, and I’m still not sure, because they have turned out to be more complicated than either my great-grandmother or my father presented them. I think that Big Grandfather, sitting silently, eating his clams while my father talked, may have understood them better than any of the others, or perhaps Big Grandmother did, for she joined him in his silence, and she ate with great gusto. Broadly, being like Black Jacques means, I think, letting yourself be seduced by your dreams, pursuing them, sending them flowers, and never noticing, or caring, that people are laughing at you behind their hands, never even quite noticing, at last, that you’ve made a fool of yourself. And being like Fat Hank means being ashamed of a dream, sneering at it, pushing it away, abandoning it as foolishness, and having it haunt you, having it leave a cold, empty spot right behind your breastbone, as if you had swallowed an ice cube when you drained your drink. But the two strains have become so mixed and confused along the Leroy line (if they were ever really distinct, for there was some Hank in Jacques and some Jacques in Hank) that the voices of Black Jacques and Fat Hank sometimes speak to me at once, and I can’t always tell which is which. Even my father, who had been so disturbed when he watched the Black Jacques in me pursuing the kittens on my mother’s parents’ lawn, still had a little Black Jacques in him. I had seen it, though I hadn’t recognized it for what it was at the time, after my parents and I left my mother’s parents’ house and moved into a little house of our own, one of thirty-six nearly identical houses thrown up one summer in the northwest corner of Babbington, on a piece of land that wasn’t good for anything else. My mother wanted my father to finish a corner of the attic as a bedroom for me. All she wanted was four plasterboard walls and a solid floor. My father began working at night on plans for the room, and on many nights he worked on into the morning, leaving for work late and red-eyed, rushing off without breakfast. But he was smiling, and the house was full of excitement. Late at night, when he finally put his pencil down and went to bed, he and my mother would wake me with their laughing and squealing and jumping about. He began to whistle. At last, one evening after dinner, he spread the plans out on the kitchen table for us to see. The room he planned would fill the whole attic, from one end of the house to the other. The attic stairs would be torn out: I would reach my room by climbing a rope ladder from the kitchen, and in the morning I would slide down a fire pole to the hall outside the bathroom. A model railroad would run completely around the perimeter of the room, through mountains, alongside a river, and through a miniature Babbington that would fill the corner that my mother had thought would serve as the entire bedroom. Painted on the walls behind Babbington would be the bay, the clam flats, the islands, and the sea and the sky, receding to a thin, precise horizon. Painted on the floor would be a chess board, where I would be able to play living games with my playmates in the neighborhood. At the center of the room, a helical staircase would lead to the top of a lighthouse that would grow from the center of the roof like a cupola gone mad. I would be charged with the responsibility of seeing that it was always lit at night. My mother and I were ecstatic. It was a magnificent conception. I would become, in a stroke bold beyond anything that the neighbors might have dreamed, the envy of all the kids on the block. The three of us dragged a stepladder to the roof and set it up with its legs on either side of the peak, just where the lighthouse was going to emerge. We took turns steadying it for one another so that we could stand on the top step and look out over the lights of Babbington, the bay, the flats, the islands, the sea. It was breathtaking. On the following weekend, my father bought a case of beer and assembled a crew of friends, and they cut a circular hole in the center of the roof. Storm clouds gathered, and there was a high-spirited scramble for tarpaulins and tents that they patched together to cover the opening. While the rain fell, my father and his helpers drank the beer and studied the plans. I could see that my father was already the envy of all his friends. After a while, since the rain kept up, the friends drifted off, and Black Jacques, thinking that there was a pretty good chance that they’d be stopping at a tavern, slipped off with them. Somehow, while the door was open and no one was looking, Fat Hank got in. My father went upstairs, with the plans in his hand, and stood under the canvas, listening to the drumming of the rain and shaking his head. He worked every evening during the next week to close the hole and patch the roof, and on the following weekend he put up plasterboard walls in a small corner of the attic and laid a floor of linoleum tile. This corner became my room. Once, later, at night, when my parents were out, I put a ladder up to the back of the house and climbed it to the roof. I walked to the center of the roof and stood where the hole had been, on my toes, looking out toward the bay. You can toss a little something Kraft's way through the Amazon.com Honor System or PayPal. Add yourself to our e-mailing list. We'll send you notifications of site updates, new serials, and Eric Kraft's public lectures and readings. Just fill in this form and click the send-it button. You'll find more swell ideas from Candi Lee here. Little Follies is a work of fiction. The characters, incidents, dialogues, settings, and businesses portrayed in it are products of the author’s imagination and are not to be construed as real. Any resemblance to actual events or persons, living or dead, is entirely coincidental. All rights reserved. No part of this book may be reproduced or transmitted in any form or by any means, electronic or mechanical, including photocopying, recording, or by any information storage and retrieval system, without permission in writing from the author. 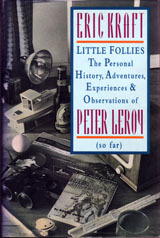 “My Mother Takes a Tumble,” “Do Clams Bite?,” “Life on the Bolotomy,” “The Static of the Spheres,” “The Fox and the Clam,” “The Girl with the White Fur Muff,” “Take the Long Way Home,” and “Call Me Larry” were originally published in paperback by Apple-Wood Books. 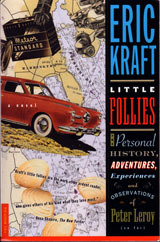 Little Follies was first published in hardcover by Crown Publishers, Inc., 201 East 50th Street, New York, New York 10022. Member of the Crown Publishing Group. For information about publication rights outside the U. S. A., audio rights, serial rights, screen rights, and so on, e-mail the author’s imaginary agent, Alec “Nick” Rafter.